Cambridge School of Belly Dance is proud to present Master Teacher and Performer Khaled Mahmoud! 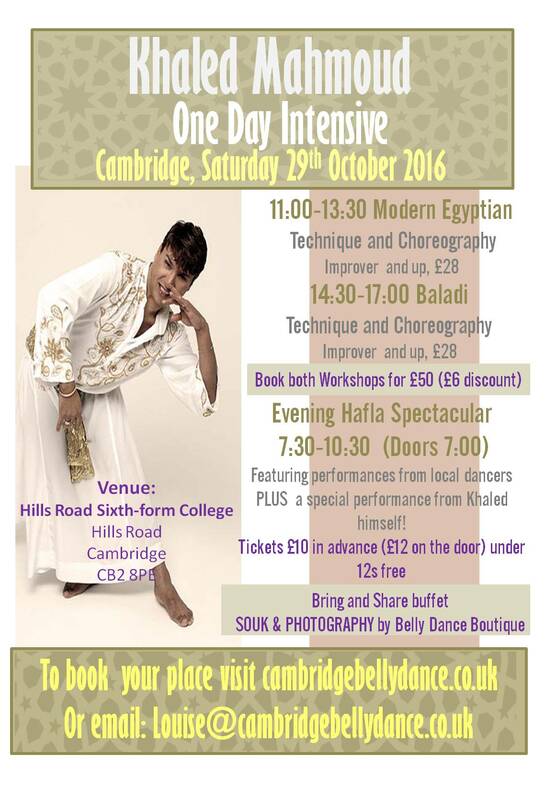 Khaled will be in Cambridge for one day only to share his knowledge with us in the form of two fantastic workshops in Baladi style and Modern Egyptian Belly Dance, he will also be dazzling us with a performance the the evening Hafla Spectacular! Khaled is a highly respected and sought-after international teacher and performer specialising in Egyptian belly dance. His career spans almost 30 years during which he has taught and performed at festivals and events all over the world, captivating audiences with his elegant hip movements and earth shattering shimmys which has earned him the name of Golden Hips. With his warm, supportive and enthusiastic approach to teaching and his unique depth of knowledge about Egyptian dance and culture, Khaled is a truly inspiring and generous teacher and to learn from him is an opportunity that is not to be missed! 14:30-17:00 Baladi technique and choreograhy, Improver level upwards – £28 SOLD OUT! Featuring performances from local dancers PLUS a special performance from Khaled, Belly Dance Boutique will visiting us with their pop-up souk to fulfill your sparkliest desires AND Krystina and the Geezer will also be taking photographs and videos during the event which you will be able to purchase if you wish! Please bring food and drink to share on the buffet! Approximately 10 minutes walk from Cambridge Station which has direct links to London Kings Cross, London Liverpool St, Stansted Airport and connections for stations further north! Hills Road Sixth-Form College is a few minutes walk from the Cambridge Leisure Park which is home to a number of resaurants as well as a Small sainsburys and a Tesco Metro. If you fancy making a weekend of it you will find a range of hotels nearby, but if you would like to be close to the action the Cambridge Central Travelodge is a mere 3 minutes walk from the College! Babraham Road Park and Ride – the bus Stops right out side the college!